Balmy beach weather in October at Pampelonne beach. Just beyond the idyllic tropical gardens, the warm white sand stretches to meet the Caribbean Sea and waves drift in to caress the shoreline before retreating again. 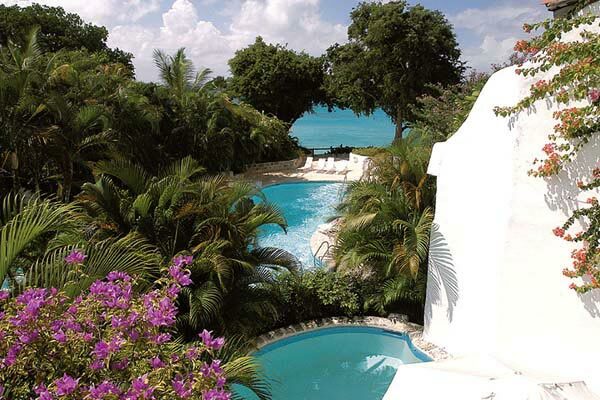 The sun beams down over Barbados, and from your beachfront villa the world is a picture of tropical tranquility. Located in the Merlin Bay community on Barbados’ beautiful West Coast, Villa Nutmeg is just footsteps from the white sand beach of Mullins Bay. This three-bedroom townhouse offers privacy within its lush gardens. The sunken sitting area which opens to the pool terrace invites you to enjoy the lovely views, and the upstairs dining terrace is perfect for enjoying dinners of delicious local favorites such as flying fish prepared by the villa’s chef. Hand yourself over to the friendly and profession villa staff who are there to tend to your needs. Efficient and unobtrusive, Villa Nutmeg’s maid, laundress, chef, and gardener work to ensure that your stay on Barbados in nothing short of divine. The warm Barbados air cascades over you as you sink your toes into the soft sand of the beach. Warm trade winds, warm Caribbean water, warm Barbadian smiles; the island is filled with a warmth and a wonder that will leave you wanting nothing more than to return again.